no all the siol can be used to build houses. 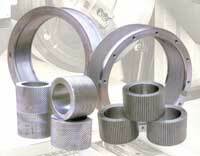 Similarly, not all the steel materials are suitable to be cast into dies or rollers. It requires excellent corrosion/rust resistance, acid resistance and wear resisitance. Our steel materials are and wear-reistanct alloy steel are used as material to manufacture anumal fodder machines. High percentage of chrome is added to increase the toughness, corrosion resistance, and strenght ; thus , the machine service life is extended. - Long service life of the cast die. - High output, and low pelleting cost. - Easy for operation, and quick to reach the peak. - Full use of the steel die, and even quality of pallets. Our KHC Series include a variety of sizes and types, and the production methods we adopt ensure that any sizes of hole shapes will be smooth and flawless. The principle is based on the rotating steel die for pelleting and the V-type belt driving, in addition to the research and design by our technicians as well as the advance manufacturing technology. Especially, The CNC gun drilling helps increase the output of dies. Over the past many years on the market, our machines have won a good reputation for excellent performance.